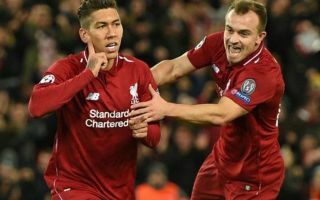 Liverpool manager Jurgen Klopp is reportedly considering dropping Roberto Firmino for the Champions League clash against Red Star Belgrade tonight. The Brazil international is not in the best form of his Anfield career right now and Liverpool have Daniel Sturridge in reserve, who looks worth a run-out. Although Klopp has been quoted as defending Firmino’s recent performances, the Liverpool Echo also claim the German tactician could make a change up front this evening. This would be a big call from the Reds boss, with Firmino showing himself to be one of the club’s most important players in recent years. The 27-year-old contributes plenty to the team even when he’s not scoring, so axing him for this potentially tricky away game in Europe might end up being a decision that comes back to haunt Klopp if he goes through with it. Sturridge has shone whenever used by LFC this season so some may feel it’s not such a big risk to how the team plays, but he is a different style of centre-forward, even if he’s arguably more of a natural in that position. It’ll certainly be intriguing to see how Klopp does end up deciding to line up tonight.